Retail Price $79.95 0 0 Like this product? Rich and vibrant digital colors shows your photos with remarkable image quality. Everything that lets your photo tell the story of a captured moment. It's perfect for office use. he Micca M707z displays your treasured photos and memories with incredible clarity. With over 3 times the screen detail of standard digital photo frames, your photos are shown with remarkable image quality, in rich and vibrant colors. See the texture on a leaf, individual bricks of a house, or freckles on a face - everything that lets your photo tell the story of a captured moment. The Micca M707z is very easy to use, with no required setup and no software to install. Just insert a storage device such as a USB flash drive or SD card with photos into the photo frame, turn it on, and the slideshow will automatically start. You can even take a SD card from a camera and play photos from it directly without any additional processing. With a built-in On/Off timer, the M707z can automatically turn itself on and off based on a flexible schedule - perfect for the office. The sleek and elegant M707z is less than 1" thick, with a brushed aluminum front and curved back, delivering a beautifully modern and sophisticated look. It is also very energy efficient, consuming only 7 watts of power in use, or about 1/2 of an energy-saving CFL light bulb. Displaying photos for 10 hours costs less than one cent of electricity. In addition to photos, the M707z also plays videos and music through built-in stereo speakers or the headphone jack. A compact IR remote is included for convenient access to playback controls. Plays videos and music with built-in speakers and headpone output jack. 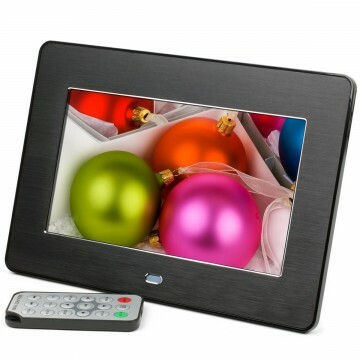 I got the one without the cheaper one first: Micca M707 7-Inch 800x480 High Resolution Digital Photo Frame (Black), was really really happy with it, decided to get more for gifts, and saw this in the "others also bought" list. Curious to see how it works stacked up to the cheaper one so I bought a couple. Worst case I could always return it (I love amazon service). Received it in good time. It's a nice clean looking frame, in fact looks identical to the m707 except for the remote signal thing on the front. Photos look great, crisp and sharp, again just like the m707. Amazing quality for a low cost product, this sets the bar pretty high now that I know what's available for cheap. This one plays video and music, so the remote is handy for moving around the menus. I had some trouble getting my videos to play, but an email to the seller got me a tutorial on how to change the video to play. I did this and was pretty amazed that it worked so well. Video was smooth and looked great. Kind of funny, realizing that I was watching a full movie on a photo frame. The built-in speakers have a thin sound, but there's a headphone jack, which is also useful for listening to music. So potentially, I could have this at the office for photos and listen to music from it. In all, amazed again at the low price and quality, definitely gift-worthy. The video feature requires some work to get going, but if you want that feature, it's probably something you need to do anyway. I wish there was a place on the frame to stow the remote so I don't lose it. Other than that, solid product and makes me glad I gave it a shot. I wasn't sure what to expect from this frame as I had never purchased a digital frame before because the prices can be a little high. I bought this as a gift for my grandparents for xmas, so I figured the quality did not have to be perfect since their sight isn't 100% anymore anyway, so I was hoping this frame would do the job, but still a bit worried since the price was so low and didn't want it to look like I bought a crappy frame. To my surprise the frame was fantstic and the photo size and quality is really good as well, plus it comes with a remote! It is super easy to use, which is exactly what I needed since my grandparents would not be able to program or add photos themselves. I was able to program everything before wrapping it up, so it would actually turn on an off at a certain time every day - so all they had to do was plug it in! The settings also hold when the frame is unplugged (but it has to be plugged in to operate, no compartment for batteries). The only down side is that the internal memory is super small, so it doesn't fit many photos. But I happened to have a mini USB at home that I don't use, so I just put a bunch of photos on there and gave it to them with the USB. This actually works out better, because it holds 100's of photos and makes it even easier when anyone want to add/change photos for them - you just take out the USB, add photos, and put it back in - DONE! You just need to make sure to get a timy USB stick, because if it's too big it would stick out on the side of the frame. Overall, for a $30 digital frame I am very happy with it and we decided to buy ourselves one too! Iordered nine of these frames for my mother to give as Christmas presents after I gifted another brand to her over the summer. Although I liked the way her frame displays the date and time in one corner as the slide show plays, this frame also displays the date and time, just with smaller photos. That's the only con I have for it. The screen resolution is very good, making most of my pictures display beautifully at full size. It also plays videos, plays music, and plays a slide show of your pictures along with music if you want it to do so. It comes with a remote that allows you to access the menu or mute the sound from a distance. One of the best features is the multiple input options provided: micro USB for direct to computer connection, SD card, or USB for a flash drive. I ordered these with SanDisk 8Gb flash drives and preloaded them with photos from my albums. I'm sure that they'll be a big hit with family members this Christmas. I love mine and highly recommend this frame. Micca M707z is a good product! Gave this to my wife for Christmas and she loves it. It sits on the window sill just above the sink & cycles through pictures all day long. Whenever she takes pictures of events (kiddos, birthdays, get togethers, etc) she simply pulls the SD card out of the camera and plugs it into the Micca photo frame & it happily cycles through the pics. The frame feels well built and has several slots for SD, USB and mini USB. You can reorient the pics of needed and set cycle speed & multiple other settings. Overall great value for the price! I bought this for my husband for Father's Day and he loves it. So simple to operate and the screen is very clear even from across our room. I recommend this for anyone that likes simplicity. Just plug it in and it is ready to go.